This is my entry in the special Alfred Shaheen exhibit for MQX New England 2016 and MQX Midwest 2016. This really cool exhibit organized by MQX founder Janet-Lee Greer Santeusanio consists of machine quilting a vintage Alfred Shaheen panel. 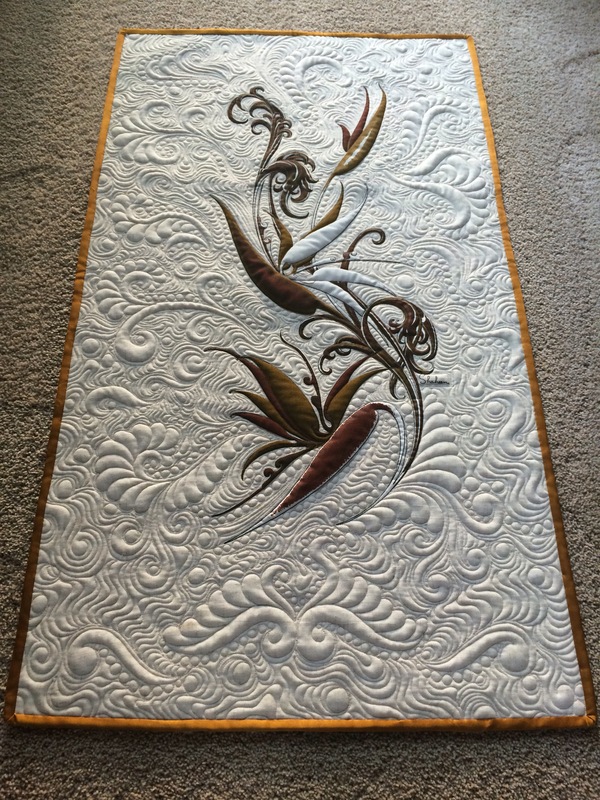 These panels, available for sale online from a few vendors, could be quilted as is or embellished. I chose to quilt mine as is, adding just a binding made of Radiance silk. I love how it turned out. I had two identical panels and had planned to quilt the other one, too; but, just ran out of time. I finished this one last August while on vacation. I’ve seen some sneek peeks of other panels on the Facebook page devoted to this special exhibit and am blown away by the extreme talent and creativity of these awesome artist/quilters. If you are able to get to the show in New Hampshire in March or Springfield in September, you need to make time to view this exhibit. 1. Purchase one of the Alfred Shaheen vintage panels from any source…. 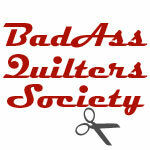 Ebay, Etsy or Christian Lane Quilters. The panel size is typically 26″ x 44″ and may be any color as long as it is an authentic Alfred Shaheen panel. 2. Keep the panel in its original size. Border(s) may be added and the final measurement must be no larger than 200 perimeter inches. 3. The piece MUST be machine quilted. The quilting style may be traditional, modern, …. whatever you desire. Oh, if you are not aware of who Alfred Shaheen was, he was the creator of the Aloha shirt and transformed the textile industry in Hawaii starting in the 1950s. Read more about him here: http://www.alfredshaheen.com. This is my entry – a Bird of Paradise print from the 60s in shades of brown. I opted to just quilt this one without adding borders or embellishments of any kind, and I bound it using Radiance silk fabric. I wanted to complement the explosion of movement from the printed design into the background quilting design and let the original design sing. I can’t wait to see everyone’s entries. You have it Goin On, girl!